1. Opening of the UN Climate Conference COP21 in Paris-Le Bourget. “It’s a historic day that we are living today”, declared French President François Hollande. There had never been so many heads of states under the same roof: 150 in total. The crowd at the Bourget was crazy. We almost lost some of team members. 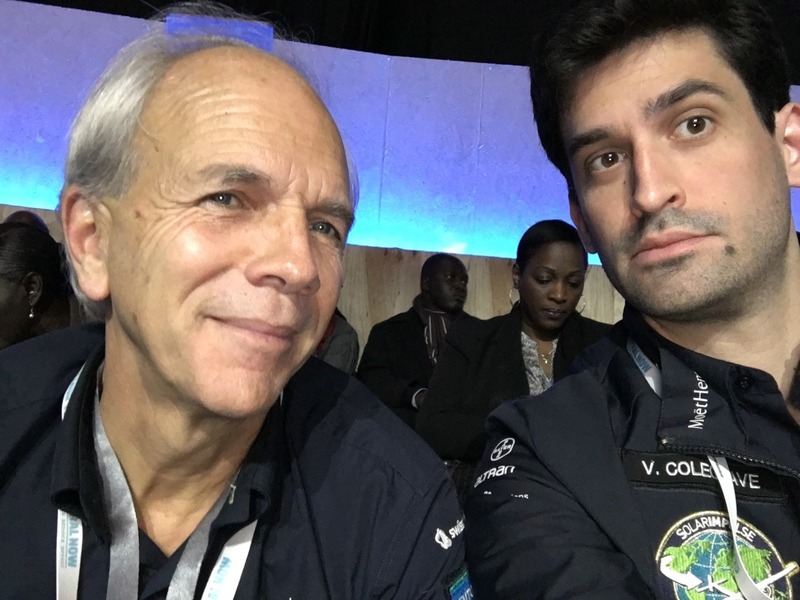 Our two pilots, Bertrand Piccard and André Borschberg, were under our watch at all time. Time given to each head of state to expose his or her point of view concerning climate change: three minutes. The time it took Agent 002 to reheat his Thanksgiving turkey. A bit short. Most speeches only scratched the surface of the problem. Leaders stressed the urgency of the issue, pointed out the many disastrous consequences for our planet, insisted on the importance of finding an agreement during COP21. Already heard over and over again. Intervention of Christiana Figueres, Executive Secretary of the UNFCCC: at least the conference has the merit of putting climate change back at the center of the international dialogue. Argument accepted. Number of cool pictures: two. Content: Bertrand and André with American President Barack Obama and Chinese President Xi Jinping. Obama invited to see Solar Impulse in the USA next year. Xi Jinping thanked for his the great welcome and hospitality when we landed in Nanjing last year. Reaction of the team: eyes widened, jaws dropped. Time to shake things up. “There is no greater threat than climate change. Have we reached such collective inertia that we cannot act?” questioned Prince Charles. We must find an agreement by Saturday if we want it to be ready by the end of the conference. Time to start talking about concrete solutions! Yesterday, Ségolène Royal, French Minister of Ecology, called for the eradication of plastic bags from the planet. Example of simple actions we need to implement now, that will drastically reduce man-made pollution. Positive reaction: COP21 is prompting action on the outside. On Sunday, Bill Gates and Mark Zuckerberg launched a global initiative: Breakthrough Energy Coalition. The aim: spur private sector investment in clean energy. Mission goal for the next days: be on the lookout for the best solutions to fight climate change. Bonus 1: a video a bout why we need to replace old polluting technologies with modern clean technologies. You can watch our day on Snapchat, and don't forget to vote for your favorite solution against climate change here.